Eduardo Maldonado is congratulated by teammates Noel Maldonado (5), Leandro Luna and Daniel Villafuerte after his game-winning shot gave the Bulldogs a 2-1 win over Sarasota Military Academy. Freshman Alejandro Garcia scored the game-tying goal against Sarasota Military Academy. The 2-1 win put the Bulldogs into the district championship game. 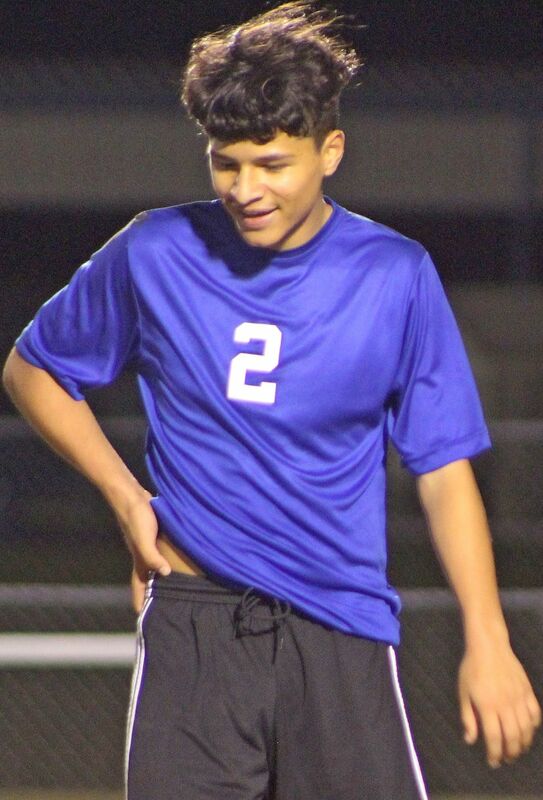 The DeSoto County boys soccer team got into the regional round of the postseason tournament before their season ended with a loss at Clewiston. The Bulldogs had to beat Sarasota Military Academy to get into the district championship game. In the district semifinals, they trailed SMA 1-0 at the half. Alejandro Garcia got the tying goal for DeSoto. With 13 minutes left in the game, Eduardo Maldonado put a header in the net to give the Bulldogs a 2-1 lead. The Bulldogs played a solid defense for the rest of the game and took home the 2-1 win. They traveled to Cardinal Mooney for the district championship, but were turned back 5-0, giving DeSoto a second-place finish in the districts. They then traveled to Clewiston, where their season came to an end with a loss to end the season.